Celebrity chef Bobby Flay opened this branch of his famous Mesa Grill in early 2007. With gorgeous views and its fusion of Southwestern and Bahamian cuisines, it has become one of the most popular restaurants in the Cove Atlantis. Just reading over the menu makes me hungry! I’m including the prices because it’s expensive. Most of the people I talked to seemed to agree that the meal was worth the price, though. 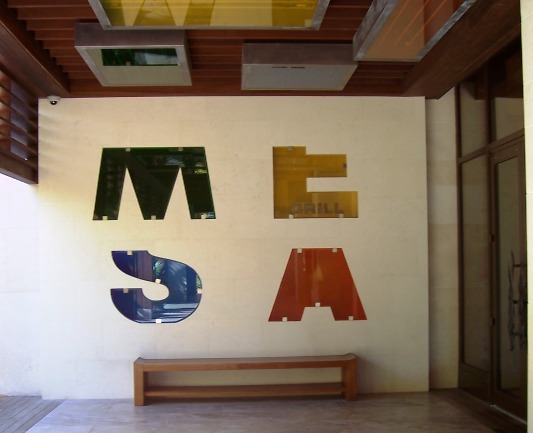 This breezy open-air corridor leads from The Cove's lobby to the Mesa Grill. Bahamian Spiced Chicken Skewers with Yogurt Cilantro Sauce & Mango Vinaigrette15.